We now have been away from Oz for seven days and it has gone quick. We have almost completed our Hawaiian leg of our holiday however we will return in early July to travel back to Sydney. There were a couple of interesting moments during the past week which we have not mentioned in previous posts. 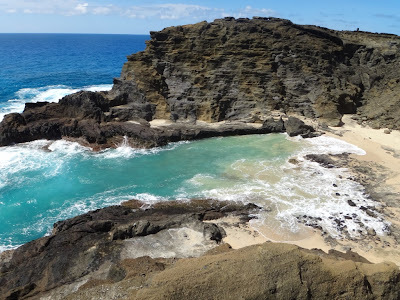 First on the Big Island of Hawaii there are no indigeous land creatures until the Hawaiians and Europeans arrived. From that time sailors carelessly brought in rats and other rodents. To rid these they introduced the Indian mongoose, however, these creatures were day time animals and rats were nocturnal. The legacy of this that the mongoose became vermin and are all over the island. When our guide was telling this story coincidently we saw one scampering next to our bus - awesome! They look like ferrets. The other intersting moment was at 5:30pm local time yesterday we were eating our dinner at a cafe when the entire building shook for one second. It was an earth tremor however the local people at the dance venue were oblivious to this stange event. The photos above are today's effort. 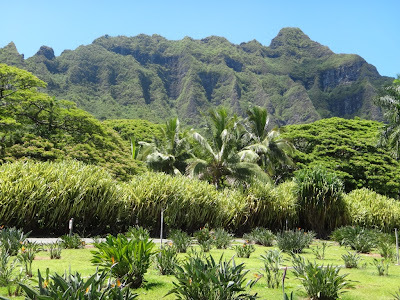 We did a bus tour circling around the island (Oahu) starting at 8:30am and returning at 4:45pm. Apparently there are two parts to this island, the windward side where the waves are huge for advance surfing and the leeward side - where Waikiki is and the populous area. 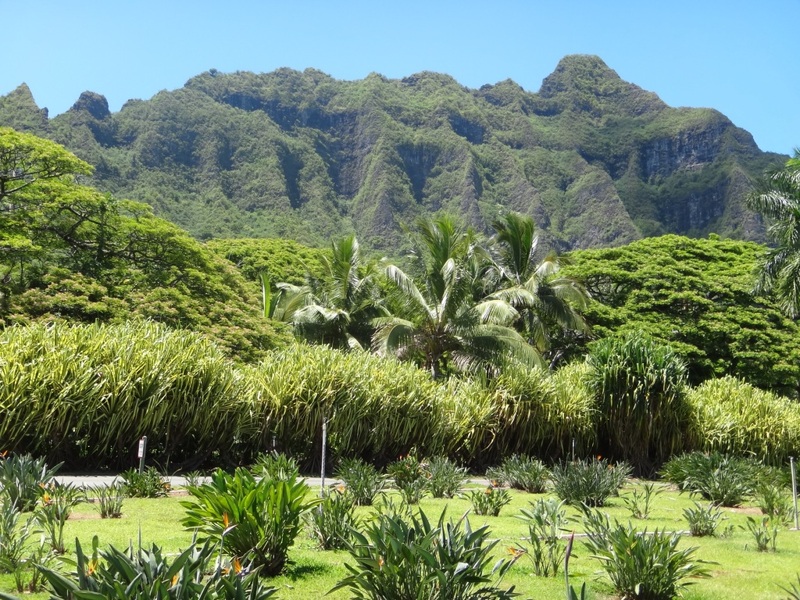 The scenic road is quie different on the windward side, pineapple plantations, rugged coastline, plenty of beaches and scenes where many movies and TV shows were filmed. The top photo is a well known location (to some oldies) where the love scene for Deborah Kerr and Burt Lancaster occurred when they were rolling around on the beach in the movie "From Here To Eternity". The middle photo is a lookout scene on the northern aspect and the bottom photo is a inland scene. If you can see the rugged mountains in the bottom photo you may see the scenes from Jurassic Park, Lost, Magnum PI, 51 Dates and others. I mentioned Magnum PI because there is a new series here in Oahu. Apparently Tom Selleck in the original series was living in a mansion along this coastline. Because it is Mother's Day here in Hawaii today when we returned to Waikiki, Dukes Bar was annoyingly crowded. It would have been a 30min wait just to order a drink. Instead we wandered down to the Cheesecake Factory and feasted into their cuisine. Their meals are huge. No way can we finish what they serve us. Well this is it for Hawaii - we depart tomorrow at 3pm for a 5.5hour flight to Las Vegas. Until then - aloha.